With winter edging ever closer, five out of the “Big Six” energy providers have promised not to hike their energy prices again, until next spring. British Gas, npower, SSE, Scottish Power and E.On have all agreed to freeze energy tariffs, with EDF only committing to no more price rises over the coming winter months. The news comes as their chief executives were summoned to Downing Street for a showdown, with the Prime Minister pledging to work “harder and faster” to cut skyrocketing energy costs. As concern over escalating price rises reaches an all-time high, the summit meeting saw David Cameron meet with energy firm bosses, Ofgem representatives and consumer groups to try and formulate an action plan to help customers reduce their household energy bills. Various measures are to be implemented, including energy firms writing to customers, advising them on ways they can save money, such as switching to different payment methods or a cheaper available tariff. The Government will also write to around 4 million vulnerable households, encouraging them to take advantage of free or subsidised loft and cavity wall insulation. Before the year is out, Ofgem will also put together a report which will recommend ways to improve conduct and transparency in the industry. “The Prime Minister wants to play a central role in sorting this out. He is determined that the big six energy companies do more to ensure that consumers don’t pay over the odds,” said a Downing Street spokesperson. 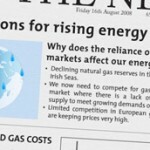 However, with the news that wholesale energy costs per customer is actually now lower than it was three years ago – £605 compared to £682 in June 2008 – encouraging people to switch suppliers to save money will do little to appease homeowners battling to stay afloat financially. It’s hardly surprising then, that Labour leader Ed Miliband has accused the Government of ‘engaging in window dressing and not real change’.